Cast on a nearby surface, it explodes for 50 points of fire damage when enemies come near. Fire Rune is an apprentice level Destruction spell that creates a rune which will explode when enemies come near, causing fire damage and setting targets on fire, dealing 30% of the immediate spell damage, scaling down quadratically over 2 seconds. You can't cast it just anywhere. When you press the cast button, the cross-hair will let you know if you are pointing at a valid surface within range. If it is red, then you can't cast the spell there. Rune Master increases range to 100 feet. 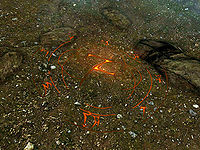 You can set off fire runes (your own or others) using any other Destruction spell from a distance. This page was last modified on 21 May 2018, at 17:14.